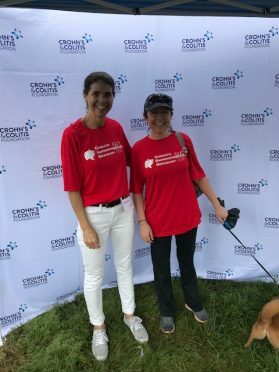 Charlotte Gastroenterology & Hepatology was honored to be a sponsor of the Crohn’s & Colitis Foundation of America’s (CCFA) Take Steps walk that took place on Saturday, May 19th at Symphony Park. The weather was a bit of concern as forecasts were calling for rain all day. However, the sun was out for the entire event providing perfect conditions for a walk around the park. The mission of the CCFA is to raise money to help find a cure for inflammatory bowel disease (IBD). Team CGH was able to contribute $2,863 through donations, t-shirt sales, and the staff favorite–Jeans Day. We look forward to continuing our support throughout the year. Stay tuned for upcoming CCFA events!